Please feel free to contact to have your site included or if you are unhappy to have your site linked. These links are not often updated. Infrormative site with details of fuel injection equipment with expereinces from experimenting with vegetable oil. Biodiesel site with interesting assessment of SVO use check..
Danish NGO promoting SVO and other Renewables, lots of good info. Offer a kit that converts vehicles to run solely on vegetable oil. German site containing extensive forum and database with details of hundreds of vehicles running vegoil. Swiss conversion kits and fuel grade waste oil supplies. German forum with lots of good links. The united workshops for vegetable oil technology (VWP). Quality SVO conversions by experienced company. Converting tractors for the '100 tractor program' where new tractors are being converted for single tank SVO and monitored. French website lots of information. alternative energy web site. SVO and biofuel info. Canadian SVO conversions. Other vegetable oil based products site contains E Beggs masters thesis 'Renewable Oil Fuels and Diesel Engines as Components of Sustainable System Design' well worth a read. "Vegoil Conversions of Diesel Engines" Dana Linscotts' vegoil site. Good FAQs, sells plans online for pre-filtering and conversion kit fabrication. "Morgan Crawford, a graduate student in the Environmental Science and Policy Department at USF is working on developing the use of unprocessed waste cooking oil." Informative site containing a number of studies. "This is my 1979 Mercedes 200D, which I've converted to run on WVO." Hong Kong to Cape Town promoting biofuels and sustainable agriculture. Good SVO and biodiesel information. Biofuel mailing groups. Detailed report from European SVO research project by Advanced Combustion Research for Energy from Vegetable Oils (ACREVO). Environmental Science, Murdoch University, Perth, Australia, and A.R. (Tony) Clark, Western Australian Renewable Fuels Association Inc.
German study of running Tdi engines on vegetable oil.
" The primary motivation for this project is to explore the use of Straight Vegetable Oil (SVO) as an alternative fuel source for compression combustion engines"
Bio-Power Network vegoil based fuels. Promoting solvent/waste vegetable oil blended fuel. Health and Safety Executive Leaflet- Domestic production of biodiesel – health and safety warning. Points to ponder although generally considered to be slightly over stated considering other dangerous chemicals regularly handled in domestic situation. "The purpose of C.A.R.M.E.N. is to promote the research, study, development and use of renewable raw materials to safeguard the future of rural areas, as well as to meet environmental, social and economic demands"
Mechanical science files providing diesel engine info. Ecotraffic - report on sustainable fuels to the sweedish government. VAG-COM supplier. Use your laptop to talk to your Volkswagen Audi Group computer. Powerfull diagnostic tool. Soon to offer a BMW/Mini diagnostic solution. 1950s Film about the development of the diesel engine. Powerfull engine simulation software - free remote use for non comercial purposes! 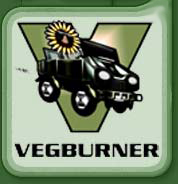 © All original material on this website is copyright Darren Hill, unless otherwise stated, and may be copied and distributed for non-commercial purposes only as long as the source of the material is stated and a reference to the vegburner website URL is included (http://vegburner.co.uk/). All material is provided "as is" without guarantees or warranty of any kind, either expressed or implied.